I bought a new doorbell. It actually came as a set, with two ringers. One is battery operated and the other is mains powered, plugging straight into the wall. I once again find myself attempting to keep up with Nick. Having seen his doorbell project I knew exactly what I had to do: it was time to hook my doorbell up to an Arduino board and put it on the internet. The red wire is +3V, the black is ground. The doorbell chime unit used to draw its power from two AA batteries, so now it gets the same three volts from the Arduino instead. The short dangling white wire is actually the antenna for wireless reception of the signal from the remote button, while the long white wire once completed the circuit to the buzzer. The Arduino treats it as an analog signal (and uses the built in pullup resistors to ‘steer’ the input to high). I should probably use it to drive a transistor to close a digital switch instead. This way works for now though. The USB cable currently supplies the power and also acts as a serial line, down which the message that the doorbell has been triggered is sent. Eventually I’d like to use an ethernet shield, or even an ethernet-enabled Arduino like this one (which I do hope will be available soon!). Here’s the Arduino sketch (tweaked slightly from Nick’s blog post). Update: it’s now housed in an Altoids tin. I have a very similar wireless doorbell, but obviously without this extreme modding. Sometimes my doorbell chimes when there’s no one there. It is very scary. Just thought I’d warn you. Thanks. Actually, my previous wireless doorbell did that too. I guess the radio signal is prone to interference. You should fix up a simple webcam to it, so that it takes a snap of your visitor and posts it to a flickr stream. Kind of a ‘Who’s at Roo’s?’. That would be fun. I’m also thinking it would be helpful to know when ‘attempted deliveries’ were no such thing. I’m convinced I frequently get a “sorry we missed you” slip through the door when the delivery person has neither rung the doorbell nor knocked on the door. It might be a bit geeky to use my timestamped database of doorbell events as evidence when complaining though. That has got me thinking… we need a vibration sensor for the cases where the visitor doesn’t ring the bell but knocks instead. Could also be used to spot things being posted through the letterbox. It seems that you might be able to get away with some sort of sound detector or something.. you would have most of the same problems with the analog nature of sound versus the analog nature of a vibrations. By that I mean to say that “when is a knock not really a knock?” (via sound.) But you would have to solve that question using vibrations, also, no? The hidden scales sound like fun. Combine it with a rangefinder and you could offer visitors a meal based on their Body Mass Index. I was actually looking at SMS operated door locks the other day, thinking that it would be handy to be able to go out without having to take keys. (Especially as I’m better at remembering my phone than my keys). My wife wasn’t convinced. In fact, she said “I’m not paying 10p every time I want to open the front door”. Great idea. Could use an accelerometer chip instead of a piezo to detect knock. I’ve been reading all this stuff, and I have to say it – hand on heart. You people really should get out more. But if I’m out, how am else am I supposed to know if someone has rung the doorbell unless it’s being logged on the internet? Hi there – I stumbled across this article and became very excited… exactly what I’ve been looking for. I’m still trying to figure out how the code “sketches” work… but have a solid background in C/C++, C#, Java, so should be no problem. Where is the file “curl” located and how do you call that from the code on your controller device? curl is a tool for talking to web servers. In this case (via the -d option) it’s being used to make an HTTP POST. The computer I was using as a bridge from the Arduino to the web is a Mac, which has curl ready to go on the command line. If you’re using any sort of Linux, it should Just Work, otherwise you’ll want to find a copy of Curl or handle the HTTP POST in whatever way is most comfortable for you. So, do you have a separate app on your Mac that reads the serial data from the Arduino when the button is pressed? It doesn’t look like the Arduino language has much to it, unless you extend it with your own C/C++ code. My idea was to have some application on the PC listening to the Arduino COM port for any data that it sends, and then handle the “ring” accordingly. In my case, I don’t want to POST anything anywhere, just send an e-mail from the local machine. Yep, that’s right. 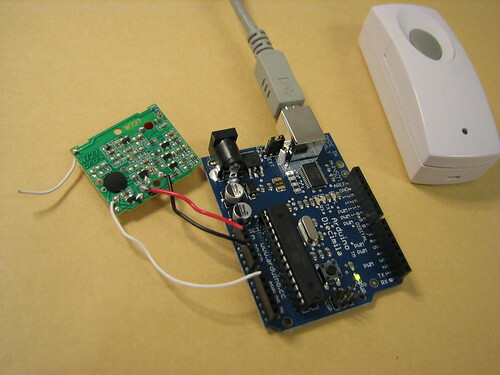 The Arduino is good at interfacing with hardware, but when I want to use an input to do something webby I had to read the serial line and handle the event on a computer. A nice alternative, if you want to avoid having a computer running the whole time, might be to use an Ethernet shield which plugs into your Arduino like this one from Nuelectronics or this (announced but unreleased) one from Tinker. I have not played with an Arduino Ethernet shield yet. From what little I know about the Ethernet shields, I’d imagine that using one to send an email should be pretty straightforward. I’ve been jealously watching Nick’s experiences with a pre-release one from Tinker. He gave a great presentation at HomeCamp which is well worth watching. Was just googling for wireless doorbells and your blog came up. The internet is a tiny place I tell yer! Nice geekout, well done. I’ve recently built one of these for my Windows server at home. Found your site when looking for suitable code to run on the Arduino — thanks for that!